The front porch of the "Lemon, Lime and Coconut" bungalow. Saturday morning, I was lying in a hammock at Lost Parrot Cabins, as Alex sat next to me quietly drawing. "Alex, what have learned since we arrived here last night?" She looked up at me. "I have no idea, Mom. What have we learned?" "There can never be too many string lights." The main cabin (and Cat's home), where you check in for your stay. We've been coming to Lost Parrot Cabins over the past 8 years (at least -- maybe even longer? ), but it had been 5 years since our last visit -- so when our friends Trish and Carl suggested we return for Labor Day weekend, we didn't even think twice. 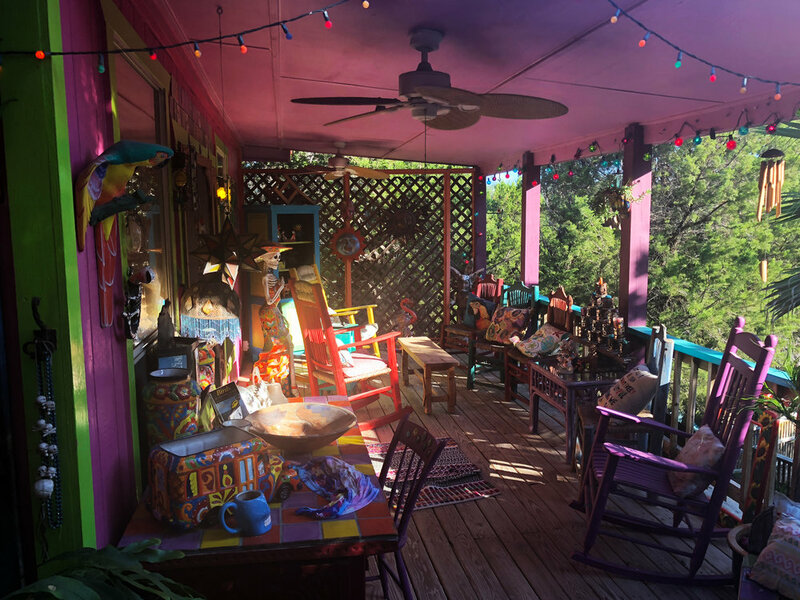 These wonderful cabins a few miles outside of Austin are an amazingly peaceful oasis, despite the fact that there is twinkling light and vibrant colour every where you look. 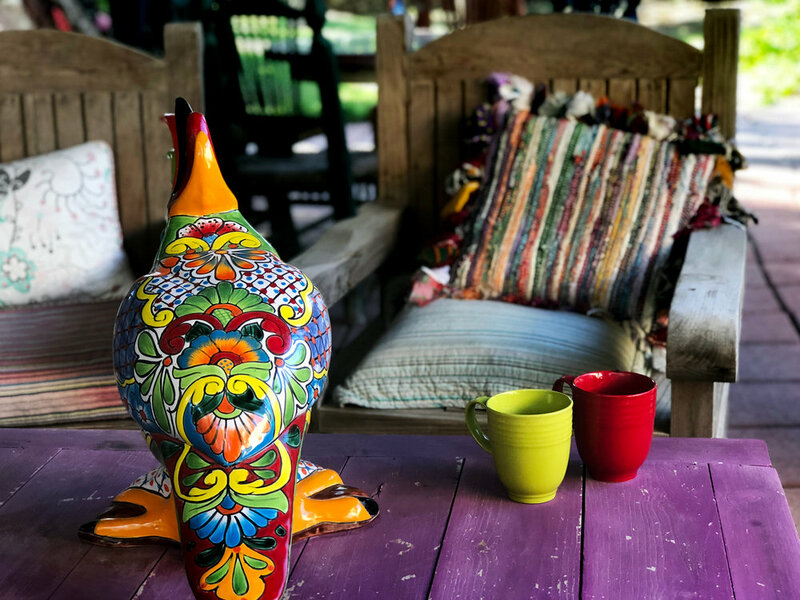 But it turns out Caribbean-style cabins decorated profusely with Central American folk art, with views of the Texas Hill Country as Latino and reggae music echoes from the speakers at the main cabin and office, make for an incredibly restorative time. The cabins are operated by the warm, friendly proprietress, Cat Flood (how perfect is that name for an artistic soul? ), who has an incredible eye for making every riotous nook and cranny look like an inviting place to sit with your book or journal. The cabins are air conditioned and comfortable, most come complete with small kitchens, and even a barbecue grill to use -- all you have to do is show up with your groceries, your favourite morning coffee and cocktail ingredients for the evening sunsets. And on Saturday night, there's even a band that plays by the pool -- you can go down to listen to them in person, or enjoy them from your porch, as the stars come out in the big Texas sky. The porch of Cat's home/main office. I just love her colour fearlessness. 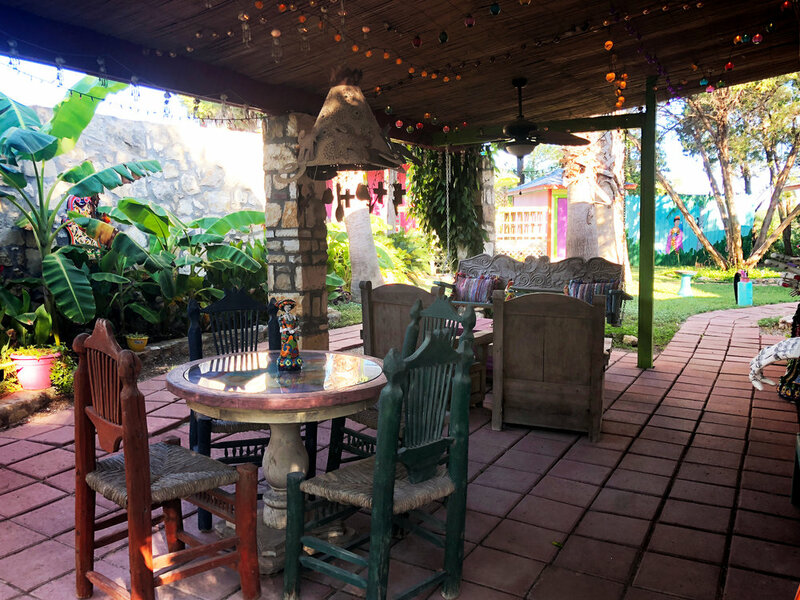 One of several cozy patios on the grounds of the property. This space especially is providing a lot of inspiration for my own patio. The spirit of Frida Kahlo is everywhere (as are these amazing calacas). 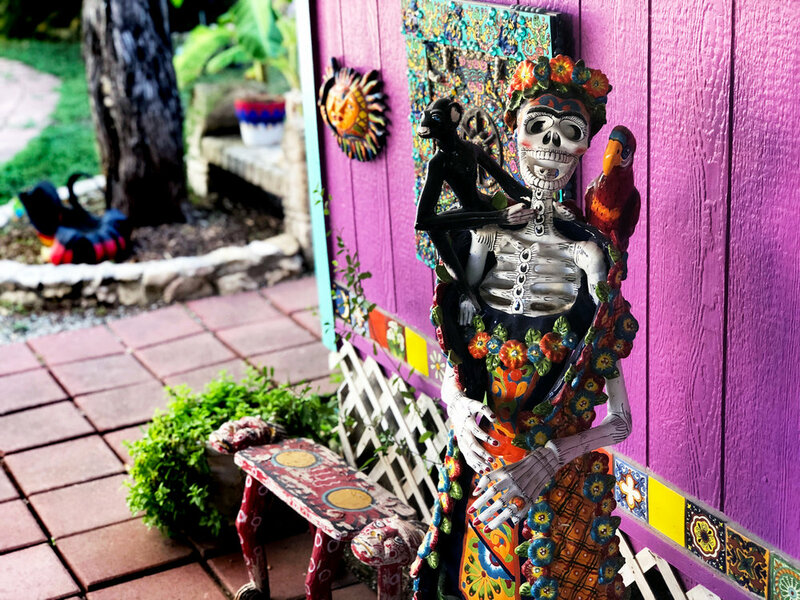 It's a pretty magical place, and such a reminder that if you decorate your space with what you love, you can't help but make it a soulful place. In fact this time, before we left, I picked up a few items from her gift shop, hoping to recreate the same feeling in our new patio. And needless to say, if you're visiting Austin and are looking for an unusual place to stay, I couldn't recommend these cabins more. Tell Cat that Chookooloonks sent you. She'll take great care of you. Because sometimes wild colour is how you get the best peace. We’re back from our quick holiday south. Here’s what it looked like. We got a shot of New York City last week. Here’s what it looked like. We spent our spring break in a magical town. Wise words from a Southwest Airlines flight attendant. A reminder of the connecting power of music. We're back from our family holiday in St. Martin, West Indies. Here's what it looked like. My second wish for my next 50 years: travel. The necessity of being a stranger in a strange land. We're back from New Orleans!